Dil Dhadakne Do was a comedy drama film directed by Zoya Akhtar. The films featured Ranveer Singh, Priyanka Chopra, Farhan Akhtar, Anushka Sharma, Anil Kapoor and Shefali Shah. It was released on 5 June 2015. Dil Dhadakne Do has collected crore 76.88 crore so far. The film had a good opening day of 10.53 crore. It showed solid growth over the weekend. But it failed to maintain its pace in the second week. The film performed extremely well in just 5-6 metro cities. While it was very poor in small centers and single screens. The film was largely affected by Hollywood release Jurassic World in the second week. 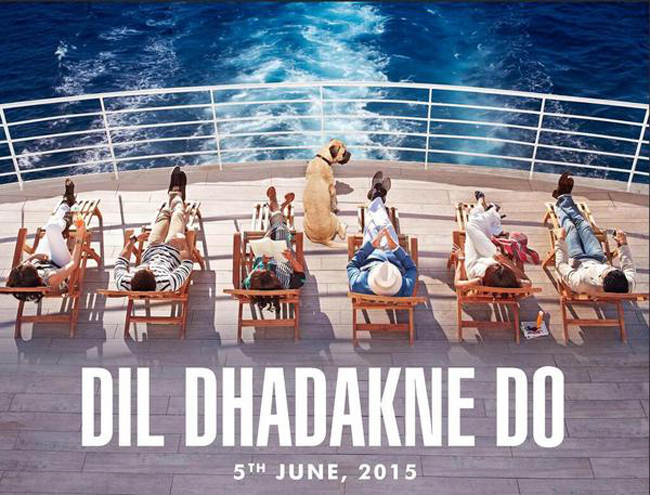 Now lets check out Dil Dhadakne Do box office collection and details. ♦ The director Zoya Akhtar last film Zindagi Na Milegi Dobara was a huge hit in 2011. But Dil Dhadakne Do has been a disappointment as expectations were very high from her. May be she will keep an eye on the budget of her film in future. ♦ Ranveer Singh received a lot of critical acclaim for his performance. It is also his second highest grosser after Ram Leela. He has also grabbed the attention of multiplex audiences after DDD. The Bajirao Mastaani actor is on the right track. ♦ Priyana Chopra also received a lot of acclaim for DDD. Though the box office collection are not that much high as it should be for PC starrer. The actress is recently focusing on women centric films. Her next film is Gangajal 2 in which she is playing the role of a cop. ♦ Farhan Akhtar had a short presence in DDD. So it will not have any effect on his career. He will be next seen in Amitabh Bachchan starrer Wazir. ♦ After Bombay Velvet disastrous result, Dil Dhadakne Do is another disappointment for Anushka Sharma. The actress mostly received negative reviews for her performance. We advise the talented actress to focus on her career rather than on her ambitious love life..
♦ Dil Dhadakne Do is a welcome change for Anil Kapoor. His grey dad character was very much loved by the audience. He will be soon seen in Welcome Back. Dil Dhadakne Do did the business what it deserves. But if the film had a better climax and had some hit music then it could have earned more. Dil Dhadakne Do will have a major impact on the ranking of top 10 actors of July 2015. The list will be out in few days. Till then check out the list of top 10 actors of June. Give us your views about the movie in the comments section.